These days, politics has become overshadowed by the 24-hour news cycle, Twitter-mania, and extremist diatribe. But not all hope is lost. In between the finger pointing, name calling and shaming that has become the norm in D.C., the Problem Solvers Caucus has emerged as one of the leading voices of reason on Capitol Hill. 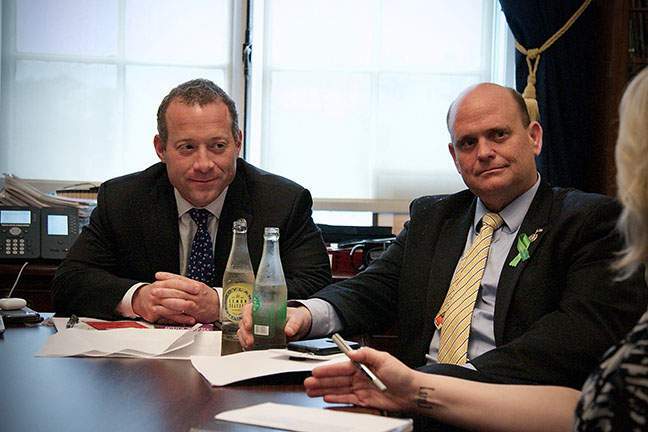 Co-chaired by Congressman Tom Reed, R-N.Y., and Congressman Josh Gottheimer, D-N.J., with a membership of about 48 members of Congress (evenly split among the two parties), the Problem Solvers Caucus lives to take on the tough issues. Bound by a can-do attitude, sense of humor and unending fighting spirit, these members cut through the nonsense and legislate from not fear or ideology, but common sense. We sat down with the fearless leaders to get a better understanding of the Problem Solvers Caucus, how they work, and what’s next on their agenda. How did you guys meet? Was it at a Problem Solvers Caucus meeting? Was it Tinder? Rep. Gottheimer: The first time we met—remember, it was a panel?—was actually in Manhattan, and someone had basically set us up to talk to each other. So it was like speed dating! Rep. Reed: It was speed dating. It comes out of the No Labels type of history. Gottheimer: They had a panel that they invited us to. Our caucus, the Problem Solvers Caucus, is 24 Democrats and 24 Republicans. There was a version that existed before Tom and I—and others—sat down and decided to reconfigure it and make it less of a place to go have a cup of coffee and spend with time with folks. [We changed] the by-laws and added a level of commitment that we were going to make as a group that, if we got to 75% of us on a particular issue or policy area, we vote together on it as a block to counter the extremism and show that we are really serious about governing and we’re trying to get to yes on some of these issues. We spent some time talking, and we both ran. That was before we reconfigured the organization. Reed: Yes, that was in the fall of 2016. Gottheimer: Then we actually sat down and both ran for our respective leadership, because it’s a co-chair setup; me on the Democratic side and Tom on the Republican side. We talked about having the same objectives and started from there. When the Caucus isn’t at 75% agreement, how do you move on? Reed: If we can’t get to 75%, we just walk away and remember “it is what it is.” That has actually happened a few times, and then we have gotten back into it. You give it a little bit of time; other events happen. We were working hard on the healthcare package, for example, in the beginning. It got further apart and then crashed in the Senate, which really was a factor to motivate people to get to the 75%. So we roll up our sleeves. When Josh talks about coming back to work at 9 o’clock at night or 10 o’clock at night, that’s accurate, very true. I have been over to his place with a group of members until about one or two in the morning. I get coffee, and he gets hot cocoa. We just keep working at it. It’s a level of respect we have. If we can’t get there, we can’t get there. We put it aside and work on other issues, and if we can get back to it, we come back to it. Why isn’t your membership list publicized? Reed: This is something we were very sensitive to. We wanted to give control to the members. You have to remember, what we’re doing to a large degree is, to many, very common-sense with a large energy of support, but to many, it’s a threat, and to many it’s not helpful for their political future. Gottheimer: Because you’re standing up against leadership, against the grain. They don’t love it when you do that. Gottheimer: I think you’ll see that most members do make it public. Our job is to actually represent the members. You can imagine that, when we’re trying to put an agreement together, the littlest things can push back an agreement, and the whole idea is to keep working until you get there, until you make the announcement. We try not to let the excitement of getting there get in the way of actually coming across the finish line. How do you determine what you work on? You have worked on healthcare, transportation. Reed: Generally, it happens organically. A member will bring up an issue with other members at our meetings or say, “This is something I want to get involved with. Can we consider discussing it here?” Then, we’ll break off into a working group. Or, what’s been happening more and more recently—since the brand has gotten out there—the White House reaches out to us, certain stakeholders may reach out to us and say, “Is this something you can potentially discuss and come to some agreement?” We’re becoming known—I like to use the term “test tube”—as the place to see if there is consensus in Congress. Gottheimer: We’ve dealt with some of the biggest issues of the day that people didn’t think we could find agreement on: healthcare, budget, infrastructure, immigration reform, gun violence… Tom mentioned the White House. Jared Kushner from the White House came to us a couple of weeks ago on prison reform. Reed: Mike Bloomberg has spoken with us. Influential people come. We’ve had a lot of exciting leaders come, and they start a conversation about the issues they’re passionate about, and some of our members catch up with them after the meeting and go from there. Congressman Reed gets up to head back to a Ways & Means Committee markup. He offers to come back, but Congressman Gottheimer suggests we call him and we can talk on the phone while he walks. Of course, they’re on each other’s speed dial. Healthcare is a big issue for our members, especially employer-sponsored insurance. We’re concerned about prices and transparency. Are you seeing that in your districts? Are your constituents concerned about drug prices, the overall rising costs of healthcare? Gottheimer: Honestly, drug pricing is the number one issue people bring up with me all the time. Part of why we wanted to take on this issue—ACA reform—and take a piece and really look at the individual marketplace and say, “Can we help stabilize things and get premiums down for folks?” is because the issue people talk to us about is their premiums, whether they’re in the individual marketplace or have employer-sponsored insurance, because with ESI you have the ripple effect and it’s all connected. Premiums keep going up, and it’s untenable. With the Problem Solvers Caucus, we took on the overall cost of healthcare, which was under attack. We still think the individual marketplace needs to be stabilized. Tom will tell you that we need more experimentation at the state level, from the states having the ability to have more ideas that can be put into play to raising the employer mandate from 50 to 500, which, on my side, was a tough pill to swallow, but it ended up being a part of the agreement we put together. Reed: Obviously drug prices are something I see in the district and with the work I do on the Congressional Diabetes Caucus (my son is a Type 1 diabetic). I am co-chair with Rep. Diana DeGette [D-Colo.]. Insulin, I think, is a poster child of our efforts to force transparency and ask some hard questions on why insulin prices are going through the roof, and that relates to a lot of drug prices across the country and how those are set. What do you think about the payment system: fee for service versus value based? Gottheimer: I don’t think you’re going to see much movement there in this climate. Reed: There is whole movement afoot—as you’re well aware—of getting away from a fee for service payment system. That’s what the “Doc Fix” was all about, that’s what value-based reimbursement policies are all about. I think you’re going to see more of that on a regulatory side than—Josh’s point—a legislative vehicle that can get through the 60-vote threshold in the Senate. Do you think the Centers for Medicare and Medicaid Services will continue to put forth more regulation on various payment systems? Reed: I do believe that will be the primary vehicle and there will be opportunities on the House Ways & Means Committee for opportunities on Medicare and others so we can continue to reformat. Do you think there is any possibility of considering anything in Congress on healthcare, whether it’s fee for service, drug price transparency, etc. through legislation? Or will it just be on the regulatory side? Is the Caucus working with Health and Human Services and CMS and presenting them with ideas? Gottheimer: We certainly spoke to them at the time. Again, I think Tom is right that you will see changes happening on the regulatory side.